on the big screen highlighting Bob's television career. Items of Bob's television memorabilia will be on display, including the Captain Cosmic costume. for a fun afternoon in honor of Bob. This event is an open house. 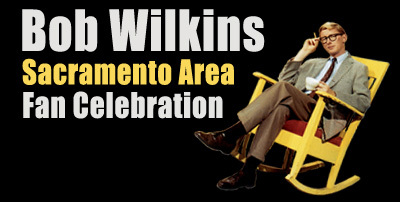 Where: 17th & "I" St.
Bob Wilkins for his Sacramento fans! display, including the Captain Cosmic costume. for a fun evening in honor of Bob. I am not a historian or an expert or a reporter. These are just my memories and opinions on the events of the day. I was privileged enough to be invited and felt I had a responsibility to at least try to covey what it felt like to be at this amazing event to honor an amazing man for those who could not be there. At The Montclair Presbyterian Church we met John Stanley and his wife Erica in the nearby parking lot. John asked what's a good looking gal like Sara doing in a place like this. John also joked that the rafters would start creaking once I entered the church. I assured John that this was a heathen proof building. 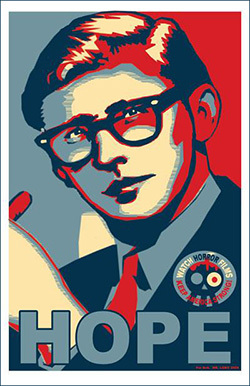 I had an armload of the Bob Wilkins "Hope" posters that I signed in silver and gave to John, Sally Wilkins, Rob Wilkins, August Ragone, Scott Moon, Bob Johnson, Bob Beavon, some of Bob's close family members and fans, Tom Wyrsch, and Ernie Fosselius, who I had emailed the design the night before. Ernie made it into 10pin-back buttons that he handed out to the Wilkins inner circle--though I ended up giving mine away to a fan. We got a lovely program with a drawing of Bob in his later years on the cover and Bob's favorite quotes on the back like "decaffinated coffee is like kissing your sister." and of course "Watch Horror--Films Keep America Strong"
The ceremony was very progressive with a charming and dynamic female minister...at no point was preachy or fire and brimstone. She even joked about Bob's disdain for church. When he did go to church he would write "Help! Get me out of here!" on the cards they keep on the back of the pews--hymn cards? There was an amazing slide presentation by Scott Moon and Tom Wrysch using the family pictures and highlights of bob on film and video...Captain Cosmic was suspiciously absent. Nancy Wilkins was first to make her remarks. 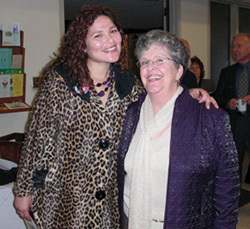 She was inspiring and strong and very funny...and talked about how Bob was a involved father who encouraged her to pursue her dreams and to be involved with her community. Bob apparently planted trees all over Oakland with Sally that now flourish as part of the local landscape. She said if you dropped Bob off in any town in America, he would find it's oldest resident and listen to their stories. Bob was very interested in lives and welfare of the people of his community and all people in general. Rob Wilkins was also inspiring, strong, and funny read his remarks as a letter to Bob--emphasizing what a sports fan Bob was...something I never knew(or failed to recognize) and that Bob would be pleased that there was a White Socks fan in the White House. Rob also confessed that he tried to host Abbot and Costello Meet Frankenstein at the School where he teaches for a Halloween fundraiser. He lit a the candle that was atop a Styrofoam skull...he left the table for a half hour and the skull burst into flames almost burning their earnings for the night. Rob and Nancy performed the song "Unforgettable" with Rob playing trumpet and nancy singing. This was not amateur hour--both were startlingly talented and there wasn't a dry eye in the house. The minister invited everyone else to share their memory or reflections of Bob. Bob always would say just the right thing and I wanted to say something that would resonate. I didn't prepare anything to say...I just ad-libbed. I tried to digest the message of every thing we saw that day. I briefly introduced my self and explained how Bob's encouragement and recognitions of my gifts transformed me into Mr. Lobo. I used to get postcards,calls, audio cassettes, letters and pep-talks and I felt I was special. Although, I realize now, that my situation was in no way unique. Bob saw the specialness of everyone and that was Bob's gift. 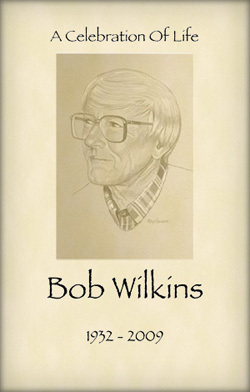 I thought Bob Wilkins was the kind of horror host I wanted to be but really he was the kind of man I want to be. Ernie introduced himself as the former Ernie Fosselius and stated, playing off of Nancy's words, that we all were seeds planted by Bob. And that here in his later years he feels he's finally blooming--enjoying the inspiration and collaboration of recent years with people like me, Scott, Tom and John who were cultivated by Bob. Will the Thrill and Monica Tiki Goddess, who did at least 6 Creature Features revival shows at Thrillville shared some very funny anecdotes. During the memorial Will wrote "Help get me out of here!" on a card and slipped it back in the pew to be found Sunday morning by some unsuspecting churchgoer. A man who I never met, who worked for city council or something, told a story how Bob is responsible for putting recycling bins at all the BART stations. 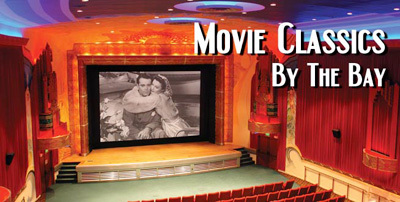 Tom Wyrsh, producer of the documentary "WATCH HORROR FILMS--KEEP AMERICA STRONG" who took frequent trips to Sacramento, told the story of how in even Bob's advanced state of Alzheimer's his favorite place to go was a movie memorabilia shop in old Sacramento. Was he looking at the horror stuff? Nope...his favorites were Marilyn Monroe, The Three Stooges, Elvis and The Beatles. Tom Fitzpatrick told about how when he and Nancy Wilkins were getting ready for their wedding. Sally and Nancy were driving Bob nuts and the wedding was growing bigger and more extravagant by the day. This was at their home in Reno, Bob at Tom were at the balcony looking over the rail at the flashing blinking cityscape of hotel casinos. Bob told him if he eloped and took her to one of those hotels to get married--that he would give him 10,000 dollars. Bob knew they shared the same humor when Tom replied "before this is over you're gonna offer me a lot more than $10,000"! John Stanley took the mike and jumped into the aisle...declaring Bob Wilkins is not dead! That he lives on through all of us! And gave the true version of how Bob groomed and trained John to take over Creature Features. Much different than the story we have all heard about John auditioning and filling a pair of combat boots with water to symbolize filling Bob's shoes. Sally Wilkins wrapped things up with her comments. Cementing the obvious that ALL of the Wilkins are strong, inspiring and funny. She stressed that Bob's release form this disease was a blessing. By the time they moved to Reno, Bob stopped going to church with Sally. While she was at church, Bob instead drove around with cans of paint and painted over graffiti. Sally felt that that was Bob's spiritual path! She told a story of Bob's last humorous moment when he unlocked his wheelchair and rolled away when Sally and the nurses where annoying him--likely flashing back to growing up in a house with six sisters. As for his passing...it was gentle. He was surrounded by his loved ones and he just didn't take the next breath and let go. Ernie and I cried like babies and Sara "THE QUEEN of TRASH" Dunn did double duty as wet-nurse and mommy for both of us. Holding hands and wiping our faces with tissue. There was a reception afterward. A video camera was set up in the corner for those who still wanted to say something about Bob or share a memory. John Stanley confided in me that he'd been putting up a brave front and fighting back tears. Sara brought me some cake and punch. Gary who manages the Balboa theater ran by with a potted plant and I never knew why.There was an adjacent room filled with memorabilia and a giant TV playing Bob's shows. Big photo albums for all to browse through. And GASP! Captain Cosmic's costume was on display. Ernie helped recreate the helmet and the belt was missing but the rest of it was intact and hanging on a manikin. Bob Johnson and I took a picture with it. August Ragone, hugged me and said I stole his best lines. Scott gave him Bob's Godzilla file that contained notes, press materials and letters written by Auggie as a kid. 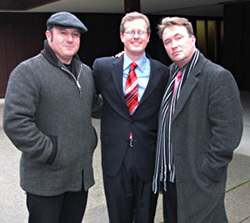 Bob Johnson and Auggie shook hands after not speaking to each other for 3 years, due to their falling out after Godzillafest. A very inspiring moment since there has been a lot of tension and hurt feelings among the diffent camps of "Creature Feature's children" with all of the overlapping film events and projects. 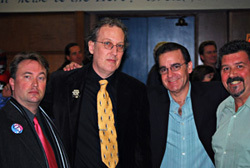 Nearly unrecognizable, Doktor Goulfinger was there sans beard. He didn't talk to any of us, which is too bad, I would have liked to bury the hatchet in the same spirit. Some fans wanted to buy a Bob "Hope" poster but I didn't want to sell anything at the memorial. I told them that they could catch me later or paypal me $10 online. A lot of people approached me about what I said, or wanted to know the status of my show. Strephon Taylor(Slob Zombie) from November Fire related some inside dope on the in-house show they opted to do on KOFY without me or instead of Cinema Insomnia. Balrok is the producer editor of the show and is a longtime employee of the station who has been pushing for a "creature features" type show. Bob Johnson and Bob Bevon talked about doing the BAFE Bob Tribute and they still want to do a live Cinema Insomnia show with me doing shtick for the reel changes to impress local broadcasters. Tom Wyrsch gave me a hug and we talked about the upcoming documentary screening and panel at Wondercon. Ernie's blood-sugar was low and we left the reception and found some Ernie-appropriate food at a local Mexican restaurant when we got back the party had moved to a nearby house. Inside, every room was filled with family friends and co-workers swapping stories. Sally gave me a big hug and thanked me for my words and the poster. We said our goodbyes and hit the road. Sara, Ernie, Scott, and I were all beat up. It was such a overload of emotions both happy and sad and everything in between. The day after, Bob Johnson and Bob Beavon told me they felt drained, too. I liked what Ernie said about planting seeds...we're all bob's trees! Although, Some of us need to grow up more than others. Bob was a honest, decent, caring guy--even through the TV screen people could see that. With all the infighting and posturing of Bob's "seeds" over who is the most special, the simple truth is Bob made everyone feel special. John was right, too. BOB will never die...we keep him alive inside us. He wasn't just a man who was a great horror host--he was a horror host who was a great man. 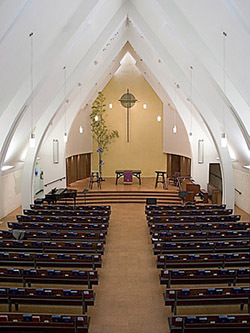 Montclair Presbyterian Church in Oakland. Cover of the memorial program. 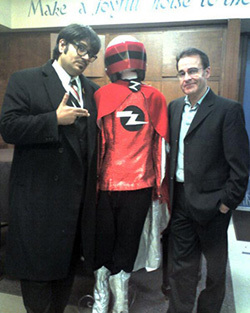 Mr. Lobo and Bob Johnson (from Bay Area Film Events) pose with the Captain Cosmic costume. and Will "The Thrill" Viharo. 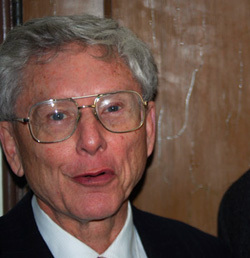 Bob Johnson and Bob Beavon. at the after memorial reception.